Who doesn’t like puppies….. I know I do! I love grown up dogs too, but puppies… any baby animal for that matter… they are something special! 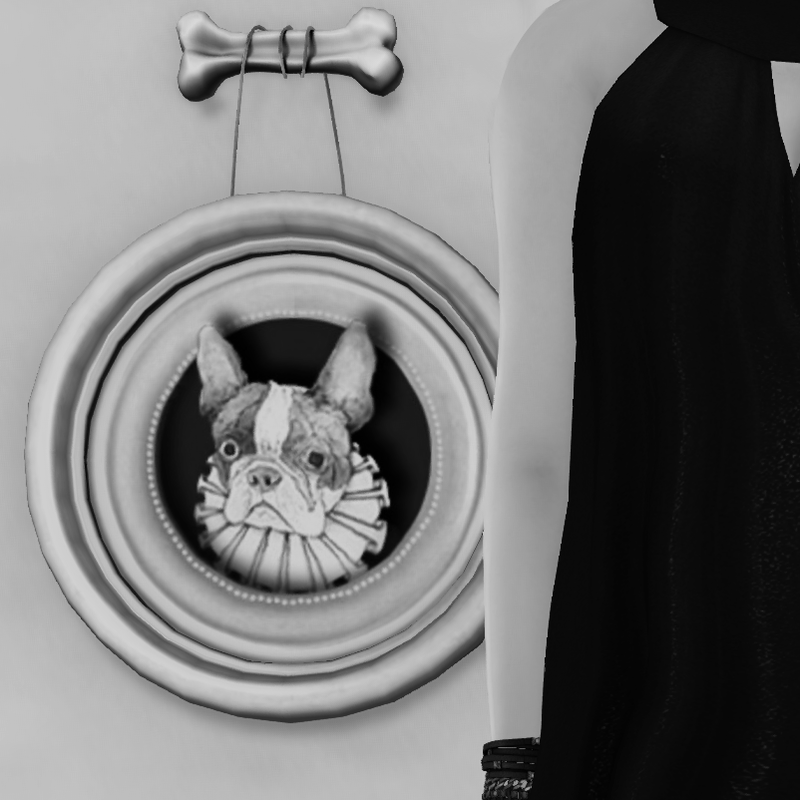 I found these puppies’portraits at a little shop called BBQQ and it shares the sim with Node and shops like Bitter Vanilla. This alone should be an indication of the cuteness to expect, really. But yeah, it’s full of cute stuff and gachas. The “real” French Bulldog puppies are from a previous Chapter 4 gacha by Alchemy. I can’t resist their gacha machines ever, even when I think that at 100 L$ per play, they are on the steep side, pricewise. Fortunately I am able to limit my plays, but I think I would spend more over all if they were slightly less expensive. There is a huge psychological price difference between 100L$ and lets say 75 L$! And then on to the clothes. This little black dress Amos is by ColdLogic. Masters of extremely wearable every day stuff, I always tend to get lost in their massive releases, but luckily I took the time to go through all of them this time or I might have missed this one. I am wearing it with Theosophy‘s Medusa pin which is currently available at Collabor88 as is the Billionaire bracelet by Mandala! My simple black decolletées are the Classic black pumps by SLink. I love this classy bob Margot by Lelutka, and I should wear it way more often than I end up doing…. and my skin is Claudia, by Belleza.